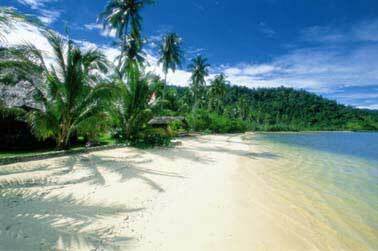 Pulau Cubadak or Cubadak Island is located on the west coast of Sumatra close to Padang with some great beaches, snorkeling and scuba divingsites. There are boats available also to take you to neighboring island for more great snorkeling and scuba diving spots. To get to Cubadak Island there are boat transfers from Padang Harbour. Paradisio has 13 bungalows, 1 suite and a fine restaurant. Most of the bungalows are located directly across from the beach. The resort has a PADI dive instructor for taking guests on dive trips or completing scuba diving courses.